^ V.L. Koshkarova and A.D. Koshkarov (2004). “Regional signatures of changing landscape and climate of northern central Siberia in the Holocene”. Russian Geology and Geophysics 45 (6): 672–685. ^ B.A.S. Davis, S. Brewer, A.C. Stevenson, J. Guiot (2003). “The temperature of Europe during the Holocene reconstructed from pollen data”. Quaternary Science Reviews 22: 1701–1716. doi:10.1016/S0277-3791(03)00173-2. ^ Masson, V., Vimeux, F., Jouzel, J., Morgan, V., Delmotte, M., Ciais,P., Hammer, C., Johnsen, S., Lipenkov, V.Y., Mosley-Thompson, E.,Petit, J.-R., Steig, E.J., Stievenard,M., Vaikmae, R. (2000). 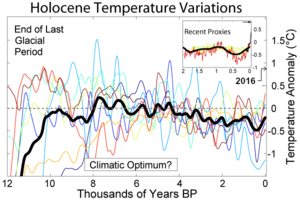 “Holocene climate variability in Antarctica based on 11 ice-core isotopic records”. Quaternary Research 54: 348–358. doi:10.1006/qres.2000.2172. ^ P.W. Williams, D.N.T. King, J.-X. Zhao K.D. Collerson (2004). “Speleothem master chronologies: combined Holocene 18O and 13C records from the North Island of New Zealand and their paleoenvironmental interpretation”. The Holocene 14 (2): 194–208. doi:10.1191/0959683604hl676rp. ^ Francis E. Mayle, David J. Beerling, William D. Gosling, Mark B. Bush (2004). “Responses of Amazonian ecosystems to climatic and atmospheric carbon dioxide changes since the Last Glacial Maximum”. Philosophical Transactions: Biological Sciences 359 (1443): 499–514. doi:10.1098/rstb.2003.1434.